Have you ever consider purchasing a rowing machine for your home gym? These rowing machines are very similar to the ones that you see in standard gyms, only they are slightly smaller and lighter. Plus, they are cheaper as well. You don’t need an expensive rowing machine to complete your home gym. Instead, you only need one of these eight. They are the best cheap rowing machines on the market. These machines provide quite a workout and can help you get into even better shape. 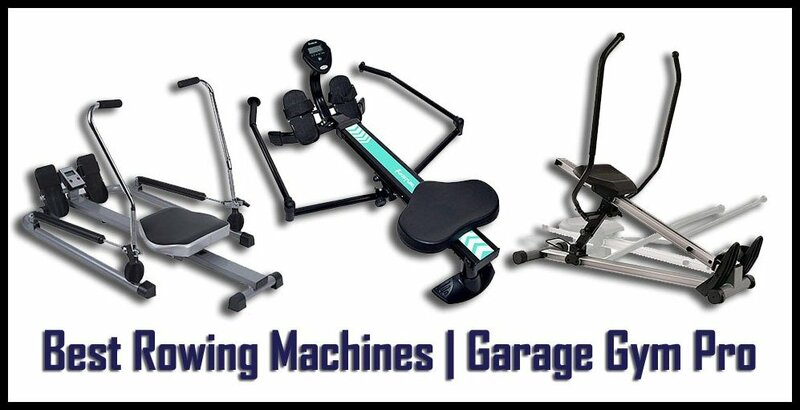 In fact, some publications have called rowing machines “the most underrated piece of gym equipment.” In order to find out why consider purchasing one of these. After all, they are the best rowing machines! There are a number of benefits to a rowing machine. The most obvious one is that your arms and back muscles get in quite a workout. You’ll even tone up your legs since your lower body gets in a good bit of exercise as well. Rowing is also a great aerobic exercise since you do receive some cardio benefits from it. These machines are considered to be low-impact since they don’t put a lot of strain on your legs or back. This means that if you have a joint problem, then this is one of the best workouts for you. On top of this, you’ll see your endurance go up, you’ll lose weight, and you’ll have a lot of fun getting in your workout. Yes, rowing is fun. Now, are you ready to check out the list of the best cheap rowing machines? Read on below. The Sunny Health and Fitness Incline Full Motion Rowing Machine is on our list of the best rowing machines because it has a number of useful features that make it a great addition to any home gym. This rowing machine has a digital console and full motion arms. It doesn’t take up much space, as it’s a mere 55 inches long by 22 inches wide and 18 inches high. 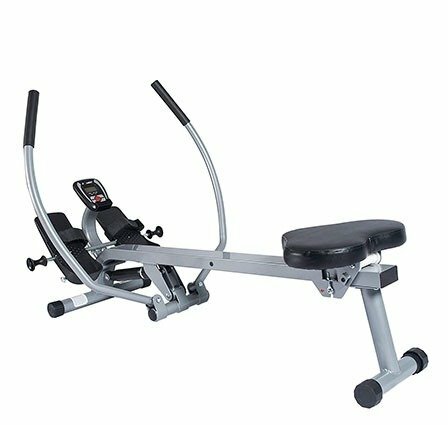 The Sunny Health and Fitness Incline Full Motion Rowing Machine provides the best rowing machine workout, thanks to the five incline levels and anti-slip pedals. It can support up to 350 pounds of weight and has a maximum incline of 17 inches. The digital display on this machine notes things like reps per minute, calories burned, total workout time, and even the total count of your rows. It also has non-slip foot pads, as well as wheels that essentially “pop out” once you tilt the machine. This makes it very easy to move around your home gym. The next entry on our list is one that is ergonomically designed. It also has a number of advanced features, all on a reasonably priced fitness device. Yes, these are just two of the reasons why the EFITMENT Total Motion Rowing Machine is the best affordable rowing machine. Everyone wants a rowing machine that they can customize to make it fit their fitness level. The EFITMENT Total Motion Rowing Machine is just that. It has 12 different levels of resistance, meaning that you can start at the lowest setting and then work your way up to the toughest as your overall fitness progresses. 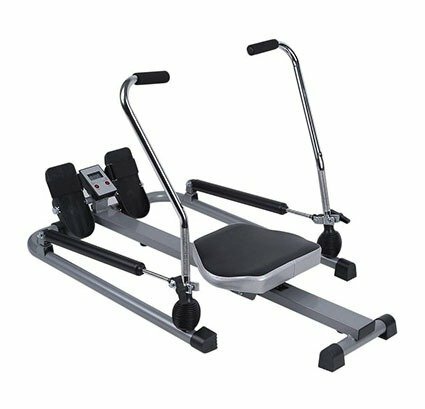 This machine offers full-motion rowing, and even has ergonomic foot pedals that make your workout as comfortable as possible. Overall, this best inexpensive rowing machine weighs a mere 28 pounds. It measures 63 inches long by 24 inches wide and 20 inches high. The slide rail length is 38 inches and it includes a digital monitor, as well as a comfortable seat. We placed the Harvil Hydraulic Rowing Machine on this list because it is one of the best cheap rowing machines. It fits neatly into any home gym, thanks to its small size. The blue accents also make this machine quite different than the others described here. The Harvil Hydraulic Rowing Machine is possibly the best home rowing machine. It has adjustable hydraulic resistance (hence the name), as well as footplates that pivot. This machine can support up to 265 pounds of weight, which is amazing, as it only weighs 34 pounds. The overall dimensions are 50 inches in length by 20 inches high and 36.2 inches wide. There’s an LCD monitor that can help you track how long you’ve worked out, as well as how many strokes you’ve done and how many calories that you’ve burned. Plus, the seat is molded for comfort, and the machine even comes with a limited warranty. Some of the devices on this list of the best cheap rowing machines are a bit more high tech than the others. 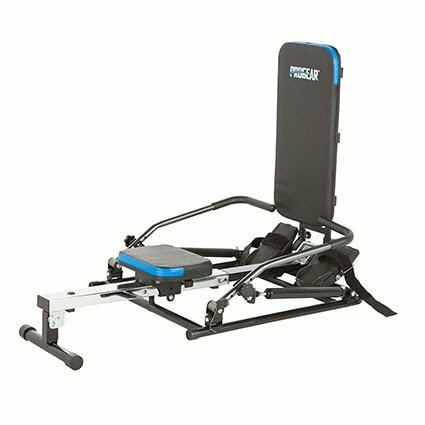 This is the case with the Merax Magnetic Exercise Rower. It comes with a magnetic flywheel and even folds up when not in use. The best indoor rowing machine is the Merax Magnetic Exercise Rower. This device has a seat that sits at a comfortable, permanent 15-degree incline. The magnetic flywheel makes it quite unique, as not many other rowing machines use this technology. This is what makes the Merax as quiet as it is. It also offers eight different level of resistance and has footplates that can be specifically angled. The machine even has a padded seat and a detailed LCD display, where you can see exactly what your workout on the best budget rowing machine has entailed. The Merax measures 76 by 16 by 21 (all in inches) when it’s fully unfolded. When folded, it’s a mere 26 by 16 by 49. It can support up to 264 pounds. If you’re looking for the best rowing machine, then you need to check out the Marcy Foldable Turbine Rowing Machine. It’s a little more expensive than some of the others on this list, but it has a number of interesting features, and it even folds up. The Marcy Foldable Turbine Rowing Machine has a computer-like display panel that makes tracking your workouts easy. It also has eight different resistance levels, a solid steel frame, and even an ergonomically-designed seat. What really makes this the best rowing machine is that it has a turbine wheel. This makes the rowing process very smooth and comfortable. In addition, the Marcy rower folds up when it’s not in use and it even has wheels that make it very easy to move around. This best home rowing machine weighs 85 pounds and measures 90.5 inches by 19 inches by 34.9 inches when it’s completely unfolded. 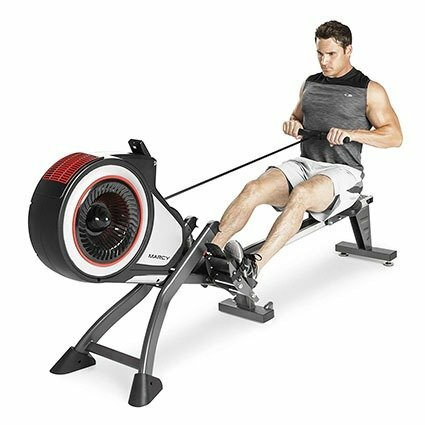 The Progear 750 Rower has made the list of the best cheap rowing machines because it has a lot of adjustable settings. This makes it easy for you to completely customize your workouts. The best affordable rowing machine also needs to be one with plenty of settings. The Progear 750 Rower is just that. 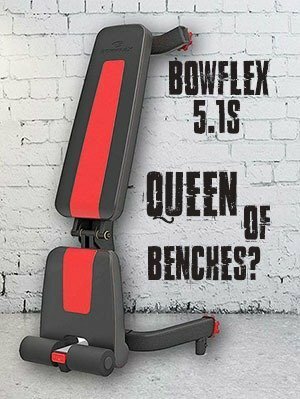 It will make a nice addition to your home gym! It includes two different independent hydraulic cylinders, meaning that you can adjust the settings specifically for each arm, just in case one is already stronger than the other. There are also three different incline rowing levels, pivoting anti-slip foot pedals, and even an LCD display. This best affordable rowing machine candidate is designed for people between the heights of 4’9” and 6’1” and it can support 220 pounds. Some of the best cheap rowing machines are those that are extremely simple. 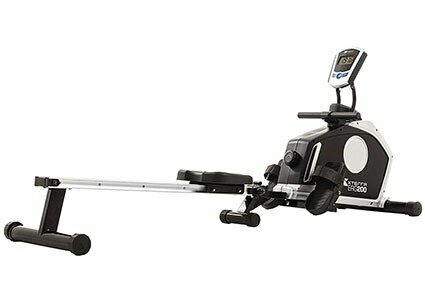 If you hate to adjust resistance or feel as though some of the other best home rowing machines are too high tech and complicated, then this is a great one for you. 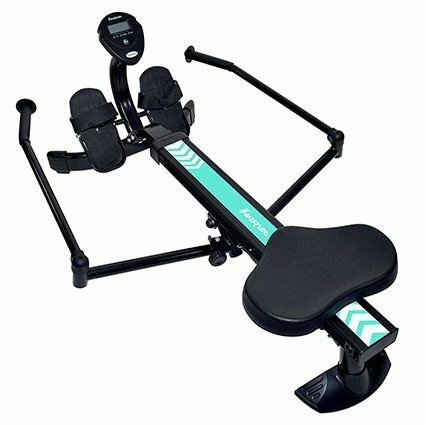 The Genuinestore Body Glider Rowing Machine is the best indoor rowing machine for people who crave simplicity. It can be folded up when not in use, and even when unfolded, it doesn’t take up much space. It has adjustable shock resistance, but not to point of some of the other best rowing machines on this list. This rower is made of aluminum, and it is very small and lightweight. Although this machine lacks the complicated features of the others, it manages to pack quite a punch, as you can work out most major muscle groups with it, and even work one arm at a time if you so choose. It also comes with a built-in LCD display that counts the number of rows that you do. 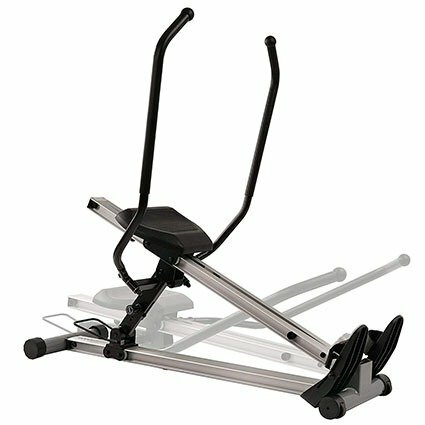 Overall, the Genuinestore Body Glider Rowing Machine is quite possibly the best budget rowing machine on the market. The XTERRA Fitness ERG 220 Fitness Rower is one of the best cheap rowing machines because it has a magnetic resistance system, as well as an easy to read LCD monitor. Some of the best affordable rowing machines come with all of the bell and whistles. The XTERRA Fitness ERG 220 Fitness Rower is that machine. It includes a 3.7 inch LCD monitor, as well as dual extruded aluminum seat side rails. This device is built around a steel frame, and it has a simple dial resistance knob that adjusts to 8 different levels of resistance. Speaking of resistance, the magnetic resistance system is designed to be quiet and low maintenance, as well as smooth. This machine counts your strokes, the amount of time that you spent rowing, the number of calories that you burned, and an overall scan of your fitness level. This rower also folds up when it’s not in use, and it can support a total weight of 250 pounds. It measures 71.9 inches by 20.7 inches by 31.5 inches when it’s unfolded. As you can see, all of the machines on this list of the best cheap rowing machines have a few pros and cons. None of them are perfect. You’ll need to weigh those pros and cons, and examine all of the features, in order to determine which best budget rowing machine is right for you.